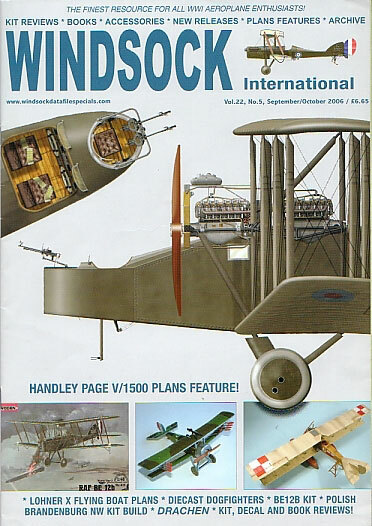 Advantages: Large format magazine with varied subject matter that includes plans, colour profiles, and up to date information for modelers of WWI aircraft. Windsock International comes out six times per year and Vol.22, No.6 completes the set for 2006. The series is a firm favourite amongst World War 1 aircraft enthusiasts with each 32 page issue bringing a diverse range of subjects to its readers. Roden’s new 1:32 scale Albatros D.III is the lead feature here with the editor himself taking to it with the scalpel. There are plenty of colour photographs which guide the reader through the build process and this is accompanied by an informative “step by step” text. To compliment the article, there are Martin Digmayer’s general arrangement and structural drawings. Thoughtfully, these are done to the same scale as the kit and will provide excellent reference material. Ronny Bar supplies the profiles for this new release and does a splendid job with two worthy colour schemes. George Haddow continues his guide on Austro-Hungarian Naval aeroplanes and this installment sees the Weichmann KG flying boat make an appearance. Plenty of photographs support the piece, together with the author’s own plans and some nice artwork courtesy of Bob Pearson. For those that like the larger scales, John Turner explains his approach to building in 1:32 and 1:28 scales. With both colour and black and white images showcasing his work, there is plenty to inspire the modeler. The IPMS USA Nationals get a full colour report which highlights some of the more interesting submissions to the WWI category. All the regular columns are present as well, including the comprehensive review section, and latest news in the industry. This is another excellent issue that continues the tradition set over twenty years ago.